Leading Wholesale Trader of pvc braided hoses from New Delhi. Our company is highly esteemed in offering PVC Braided Hoses to the clients. PVC Braided Hoses are manufactured under the guidance of skilled professional by using premium grade material and latest techniques. This product is praised by clients for owning remarkable characteristics. Offered range is applauded and cherished in the mark to precious design and long life by the esteemed clients. This product is well tested by the quality controllers on different stages before the delivery. Offered range is dispatched in quality assured packaging material. 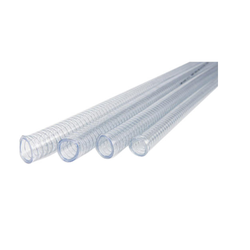 PVC Braided Hoses offered can be made available by us in different finish configuration choices and can be custom developed as per the specifications provided by the customers. These reinforced polyester yarn braided hoses provide for superior usage reliability at high working pressures. Some of its features include smooth bore finish coupled with high flexibility; providing for excellent flow rates; manufactured quality crystal clear P.V.C. compounds for lasting performance; resistant to wide range of chemicals; tube manufactured from low toxicity PVC material.